So everyone wants to know if the movie about the serial killing, telekinetic tire is any good. I guess it depends on your interpretation of good. If youâ€™re looking for a wacky, ultimately silly story youâ€™re in for a real treat whereas if serious, â€œmeaningfulâ€ film is more your cup of tea, you might not want to hold your breath for Quentin Dupieuxâ€™s Rubber. Thatâ€™s not to say that the film doesnâ€™t have a little something more going for it. I expect that in the coming year or two weâ€™ll likely see a 2,000 word essay which explores and tries to explain the importance of the crowd watching the story unfold (Iâ€™m actually quite surprised that essay hasnâ€™t turned up already) but as the end credits roll, deep thought is the farthest thing from anyoneâ€™s mind and instead, weâ€™re wondering when weâ€™re going to see a sequel which features a tricycle and an army of telekinetic tires (I can already see the studios snatching up that idea and spitting out a lame version of that premise next year). 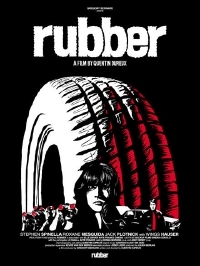 Rubber opens in perfectly hilarious style with a car, swerving itself along a dirt path, no driver in sight, and stopping suddenly, allowing Deputy Xavier to jump out of the trunk, and continues its trip down comedy lane with each of the scenes that follow. From the tireâ€™s realization that it can make stuff explode to the â€œaudiencesâ€ realization that theyâ€™re not just there to watch a boring movie. The audience itself does make some pretty hilarious observations on the slow pacing of the film and how nothing is happening (at one point theyâ€™re staring out into the desert wondering when something is going to happen until someone excitedly points out that in the distance, something moved â€“ undoubtedly a poke at the tediousness of some films) before they are eventually annihilated. Sure to be a winner with b-movie fans and likely to sprout an immediate, and deserving, cult audience when it finally starts playing outside the festival circuit, Rubber is a wonderfully fun little slice of the absurd, a film that entertains from opening to closing and though the audience subplot suggests some larger message Dupieux was trying to get across (or perhaps he was just baiting the audience - I certainly wouldn't put that past him), itâ€™s drowned out by the awesomeness of the violent action. Rubber is definitely one to be seen, enjoyed and seen again. I saw this about two years ago on Netflix. If you're looking for something off beat and the MC is a tire give this a look.